A DRUNK dad beat and stamped on his ex-partner ‘like an animal’ and sent threatening, Islamophobic messages after she took a Muslim lover. Peter Finch was jailed for 12 months at Worcester Crown Court after he beat his ex in a drunken rage which left her with a suspected broken rib. He denied assault occasioning actual bodily harm against girlfriend Rebecca Harding at her home in Worcester but was found guilty at trial. 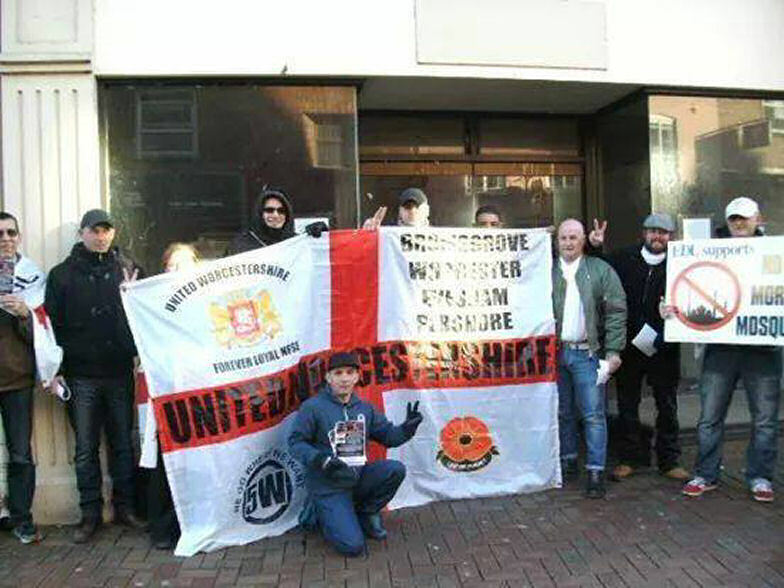 The 31-year-old, who said he was a former member of the English Defence League, previously admitted criminal damage to a door and malicious communication which was deemed racially or religiously aggravated between July and October last year. Finch of Patterdale Drive, Warndon, Worcester, carried out the assault in May last year after Miss Harding, his partner of five years, returned home from work at about 6pm. Mark Phillips, prosecuting, said: “The relationship was characterised by this defendant becoming aggressive when in drink. “It was clear he had been out at the pub during the afternoon and was suffering from the effects of drinking too much. The attack happened in a bedroom where she had gone to get changed. “She described the defendant flying in and punching her in the face. “The blow with his right hand struck her right cheek. She saw it instantly swelling up. He pushed her to the floor where he held her by the throat. He was described as kneeling on her while he punched her repeatedly in the body. Mr Phillips said: “Whilst doing so he said ‘this is what I would have done to him’, presumably referring to the man he believed she was having the affair with. “He stood up. She was curled up in a defensive position, into a ball. She was on her side, exposing her right flank. He then stamped on her ribs. “She cried out in pain. It was only at that point the defendant seemed to have any sort of remorse about what he had done, saying he was sorry. Miss Harding suffered bruising and a suspected broken rib during the attack. She went to see her doctor and had her medication for depression ‘doubled’, Mr Phillips said. When Finch learned Miss Harding had travelled to Marrakech and had a new Moroccan boyfriend he sent her a number of abusive texts and WhatsApp messages. Mr Phillips said: “There was reference to enjoying her time in a burka, clear reference to her being with a Muslim man. Finch represented himself because he was not eligible for legal aid and could not afford to pay anyone to represent him. Judge Nicholas Cole said the assault was aggravated because it took place in front of a child. Although the physical injuries were limited to bruising and a suspected broken rib, the emotional impact had been ‘severe’. He said of the threatening messages that he was satisfied that they were partly motivated by hostility towards Muslims. He sentenced him to 12 months in custody for the ABH, four weeks for the criminal damage and three months for the malicious communicated with an extra month added because it was religiously/racially aggravated (four months in total). These sentences will be served concurrently to the 12 months, making a total sentence of 12 months. No separate penalty was imposed for breach of a conditional discharge. An indefinite restraining order was granted prohibiting him from having contact with Rebecca Harding. A VIOLENT demonstrator identified after giving an interview to a current affairs website has been jailed for 18 months. Josh Downey’s first name, age, home town and photograph were published on the New Statesman just two days after the “anti-immigration” protests in Dover on Saturday, January 30. Detectives recognised the 22-year-old, of Offenham Road, Evesham in Worcestershire, as being responsible for offences committed throughout the day and sent Downey’s picture to his local police force for identification. He was arrested on Wednesday, May 11 and later pleaded guilty to one count of violent disorder. At his sentencing on Friday, August 12, Canterbury Crown Court heard how Downey was filmed throwing numerous objects at opposition protestors in Effingham Street, Dover. He was later spotted hurling further items while in Folkestone Road, and was also seen in possession of a large piece of wood. When further fighting broke out later in Market Square, Downey was again caught throwing objects including two large pieces of wood. Detective Sergeant Matthew Smith of Kent Police said: “The investigation team have arrested more than 70 people in connection with the demonstrations in Dover and they continue to review hundreds of hours of footage captured on the day. “Although Josh Downey gave us a head start by allowing his details to be published online, my officers have shown they are more than capable of identifying those responsible through good old fashioned police work and a determination to succeed. ‘A WORCESTER City Council election candidate has sparked fresh fury by casting doubts about the Holocaust – on a sick website hosted in Russia. We revealed earlier this week how Carl Mason, who is standing in the Nunnery ward in May, has quit as the city’s BNP organiser to launch a new right-wing group called the ‘British Resistance Party’. But the controversial figure, who was questioned by police last Saturday after stickers linking the Labour Party to paedophiles appeared on lampposts, is now coming under fresh scrutiny for his online blogging. The 50-year-old is a writer on a website called the ‘European Knights Project‘, which claims to provide a platform for people looking to “preserve Christian culture”. On it Mr Mason, who boasts about waging “a one-man war against multiculturalism”, says many Germans were jailed for “doing little more than following orders”. He also refers to the documented history of the Einsatzgruppen, where Nazi death squads were responsible for the mass slaughter of Jewish people, as wrong – saying “they did no such thing”, claiming the Germans instead shot “Communists” as a “revenge” for allied forces taking their farms, factories and homes. He also cites doubts about several other elements of the Holocaust, before suggesting a conspiracy is at play to fool people. “Could it be to control people’s voting habits, and in turn keep certain political parties in power, and in the money,” he writes. “Is it being done in a manner so we feel sympathy towards the people that control our money supply, run our banks and media, so people are socially conditioned to hating people like me? He also refers to wanting to “stand against Islamism, Zionism and British traitors”. Mr Mason has told this newspaper he was “not denying the Holocaust” but admitted writing the posts because of doubts over the official narrative. “If I wrote that in 53 countries I’d be arrested, that’s why the site is hosted in Russia,” he said. Worcestershire MEP James Carver, who is of Romanichal descent, has called it “despicable”. “It’s disgusting, the historical facts about the Holocaust are clear,” he said. West Mercia Police are taking no action against Mr Mason for the stickers linking the Labour Party to paedophiles, after he denied sticking them on lampposts. He did, however, admit to printing off “around 2,000” to sell to other people. “A POLICE probe has launched after smear campaign stickers linking the Labour Party to paedophiles appeared across the city – with a council candidate being questioned. In recent months these labels have been found stuck on lampposts across Worcester, with West Mercia Police now deciding to intervene. We can reveal how Carl Mason, a gas engineer who used to run the city’s British National Party branch, was visited by officers on Saturday evening. The 50-year-old, of Keble Close, has admitted producing “around 2,000” of the stickers in recent years to sell them on, but insists he has not put them up on any of the lampposts himself. The stickers, which have been spotted in areas like Tolladine, St John’s and St Peter’s, makes bizarre claims about Labour being a ‘paedo party’ and features details of a website detailing court cases for child sexual offences involving its former councillors nationwide. its members have been complaining about the stickers. But Mr Mason, of Keble Close, who is standing in the local elections in May, has hit out at his treatment and says he wants to be left alone. “Between five and six o’clock two coppers knocked on the door and I think they were embarrassed to be there, to be honest,” he said. “They said ‘we’re not charging you, you are not under arrest, we just want to ask you some questions’. 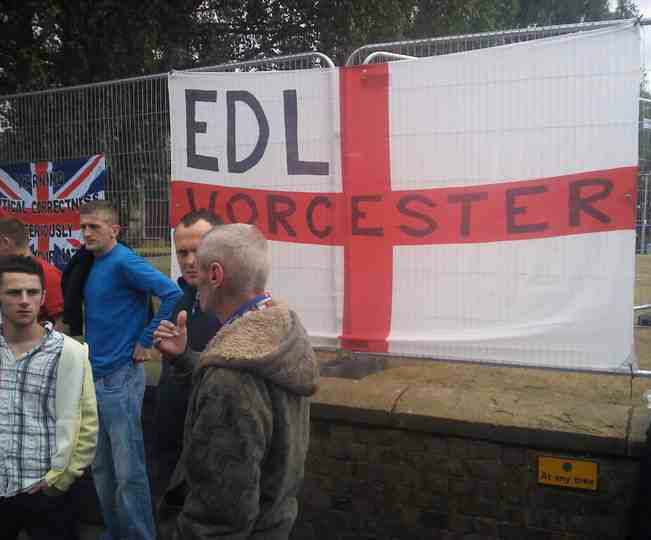 “They told me they’d had a complaint from Worcester Labour Party, and I said I’ve seen them around town. Labour Party sources said they felt the stickers have gone too far and need to be stopped. Roger Jenkins, the branch secretary, said today: “Technically it was an individual of the party who made a police complaint, but I can’t divulge who. Worcester City Council has been taking down some of the stickers in recent months when staff spot them, saying the tactic is illegal flyposting. A spokesman for West Mercia Police said they were unable to confirm what stage the probe was today. Mr Mason has tried to get elected onto the city council for the BNP, and is standing in Nunnery this May for the newly-formed ‘British Resistance Party’. More local boneheads to look out for.. 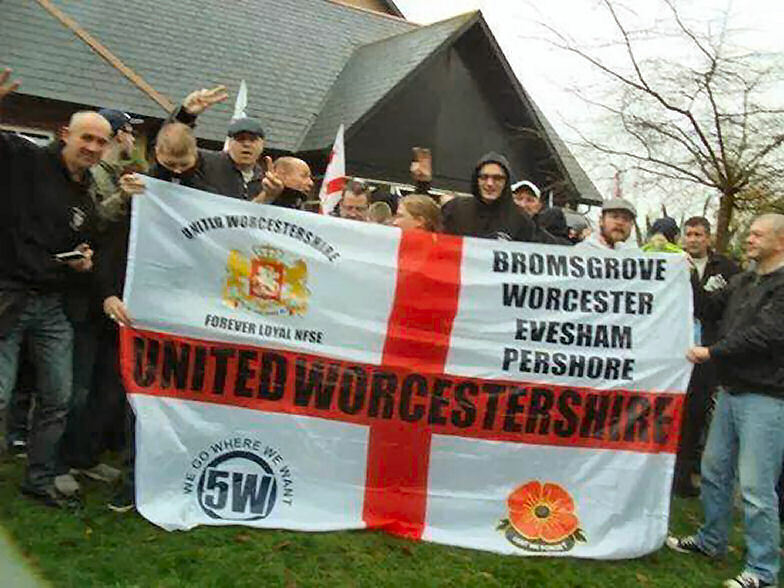 So-called “United Worcestershire” racists – soiling the streets of Dudley with their filth 7th February..
Faces of hate to look out for in Worcestershire.. The Hunt Saboteurs Association (HSA) is pleased to announce its affiliation to the Anti-fascist network (AFN). The HSA has always had a policy of inclusion, welcoming anyone into our ranks regardless of race, creed, gender, religion or sexuality, and has been forced over the years to confront and exclude people who have been proved to be racist or fascist. Our active members have for years been the subject of racist (and sexist) abuse from the hunting community which only highlights that our struggle to end hunting also promotes a more ethical attitude to both humans and animals. Both the HSA and AFN promote a policy of confronting those engaged in racism and hunting respectively, on the streets and in the countryside. To not only stop such activities continuing but also to highlight them to the wider public. While other organisations hide their heads in their hands, hoping that a few leaflets or email shots will make the problems go away, we are clear that the only way to end both hunting and racism is confront it head on, so those who partake of such actions and attitudes are clear that we will oppose them until they stop.